Dental Implant are offered to all our patients as a dental option by the dentist, when there is a single tooth missing. The missing tooth can be easily restored or replaced by the dentist in Geelong using a dental implant. Single tooth replacement with our dentists at Geelong dental are affordable dental option for a single tooth missing. Geelong Dental implant for single tooth missing is also a simple dental procedure. This procedure can be done by the dentists using local anaesthetic at our dental clinic in Geelong. 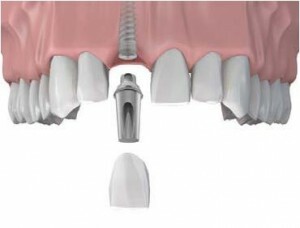 Single tooth dental implant is one of the best options when compared to a partial denture or a dental bridge. The single tooth replacement with our dentists in Geelong has several stages. Please note there will be variation in appointments and procedures from patient to patient. Tooth implants are done on a individual dental needs of the patients. In the first dental appointment with the dentists for your dental implant. Medical and dental history of the patient is discussed with the dentists. The dentist will recommend a periapical x-ray to be taken as a preliminary tool to determine whether an dental implant can be placed or not. Dentists will also refer patients for 3D scans and the findings will be discussed in your next dental implant appointments. In this dental appointment with the dentists. 3D scans are discussed. The costs and timing of the dental procedure is also discussed with the patient. The dentist will also order for impressions of the upper and lower teeth to be taken. The whole dental procedure will be discussed by showing video and also some visual aids to the patients. Dentist will also consult and book an appointment for implant placement. This is also the Surgical phase dental appointment with the dentist Geelong. Where local anesthetics are given and a small cut is placed in the gum. A pilot hole is placed using a small round drill, then varying lengths of the drills are used to adjust the width and length of the area. Then the dental implant will be placed by the dentist. If necessary, bone grafting may also be carried out by the dentist. If possible the dentist will place a temporary tooth and gums are then sutured up. Antibiotics and pain killers are also prescribed by the dentists to help better recovery after this tooth replacement procedure. This is the recall appointment by the dentist for checkup. The patient returns to the dental clinic on the 3rd day after the placement of dental implant by the dentist. The patient is reviewed by the dentist to check for any infection, swelling and pain. Dental appointment five usually happens 6 to 8 weeks after the dental implant placement. A small cut is made and the healing cap is exposed. The dental implants are checked by the dentist to see if it has bonded to the bone. The dental implant is exposed and left for a further two weeks to plan the next stage of the tooth replacement process. In this appointment with the dentist. Dental Impressions are taken and sent to the dental lab to make a crown. The dentists will call you and book you for another appointment when the dental crown arrives for it to be fitted to the implants. Dental appointment seven is the final stage of the dental implants where the dentist attaches the dental crown to the dental implants. The dentist will discuss with the patient to educate how to take care of their dental implants. Good oral hygiene which includes regular dental check-ups with the dentists and good eating habits will also aid in the life of the dental implants. If you need any cosmetic dental treatment like dental implants for Teeth replacement. Please call our dental clinic in Geelong at Norlane to book your dental implant appointments. Speak to our qualified cosmetic dentist doing dental implants in Geelong.